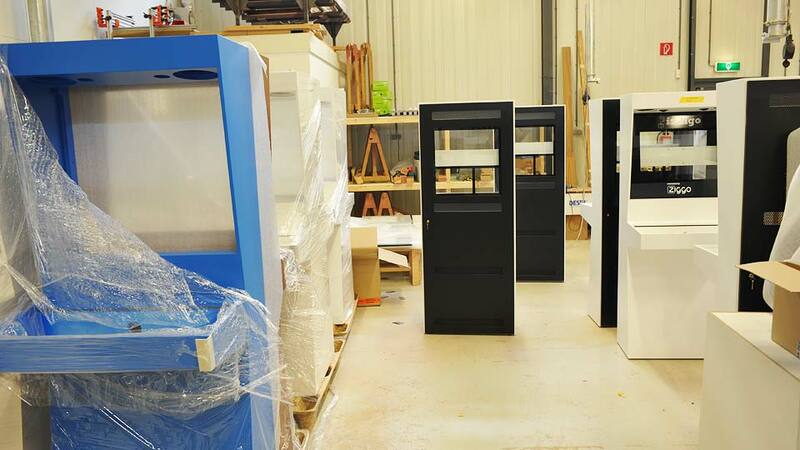 We just installed the first Retro Space 4.0 aluminium cabinets at the Sint Lucas Game Lab in Eindhoven. A nice way to mark the tenth aniversary of the Retro Space cabinets. The best modern arcade cabinet ever built and the best arcade cabinet you can buy today. 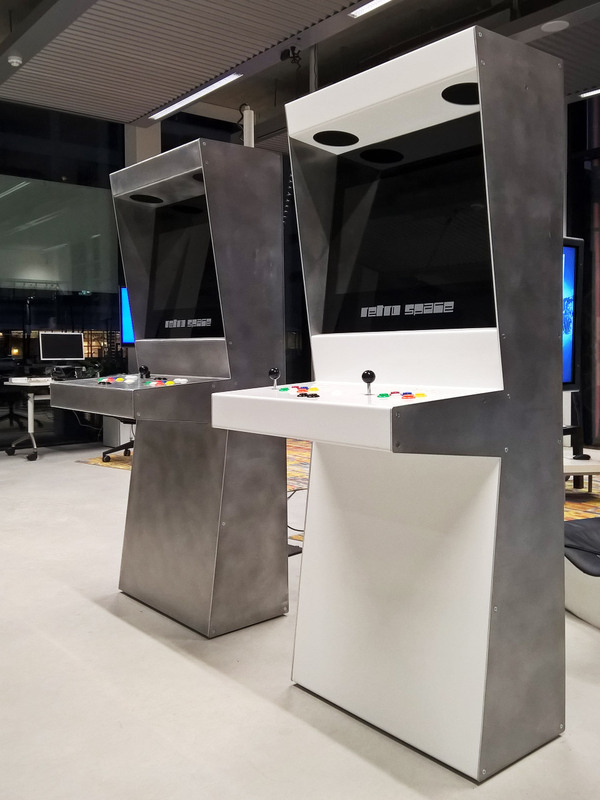 Retro Space is releasing an all new arcade cabinet. Our fourth incarnation is built in laser cut and folded aluminium. It will be available in rotex polished blank alumium with linseedoil finish, or with the folded parts being powdercoated in your prefered RAL colour. The new version is sturdier than ever, easier to service and totally modular. The option to mount a rear display is present as well. Jump to the tech specs of the new aluminium cabinet. Retro Space The Original in semigloss RAL 1003 yellow. Closeup of the original controller panel. This one is in use for 8 years now, has been rented many times, and looks and works like new. 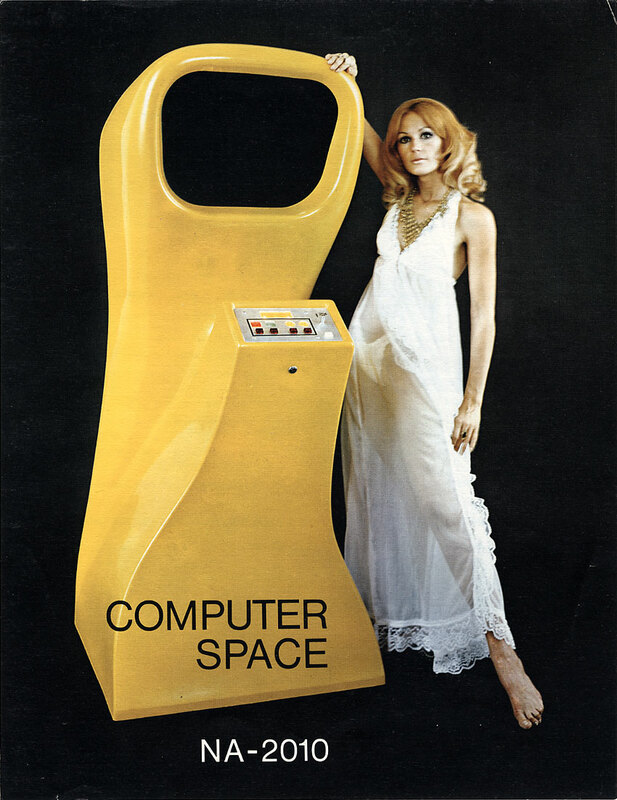 In 1971 Nolan Bushnell created the first coin operated video arcade machine “Computer Space”. The striking yellow fiber-glass cabinet and the remarkable marketing flyer lead the way to almost 4 decades of video arcades. After this first video game machine, the cabinet design became less important than the games inside. The video game cabinet was mostly side art stickers on black melamine furniture ever since. Today the video arcade, as an institution where we hung out, is dead. The few that are still open either struggle for life or generate income by other means. The home gaming console and its owner mr. couch potato have won the battle. As a homage to the video arcade era, and especially to honour the design of the first ever arcade cabinet, I created “Retro Space”. The perfect machine to mark the end of this marvellous time in gaming history. Either as art or as the ultimate gaming gadget. Retro Space promotional flyer, modern interpretation of the classic Computer Space flyer. Wouldn't it be great to relive your classic gaming experiences on a machine that is made for the future? Retro Space is a pretty cool piece of furniture. 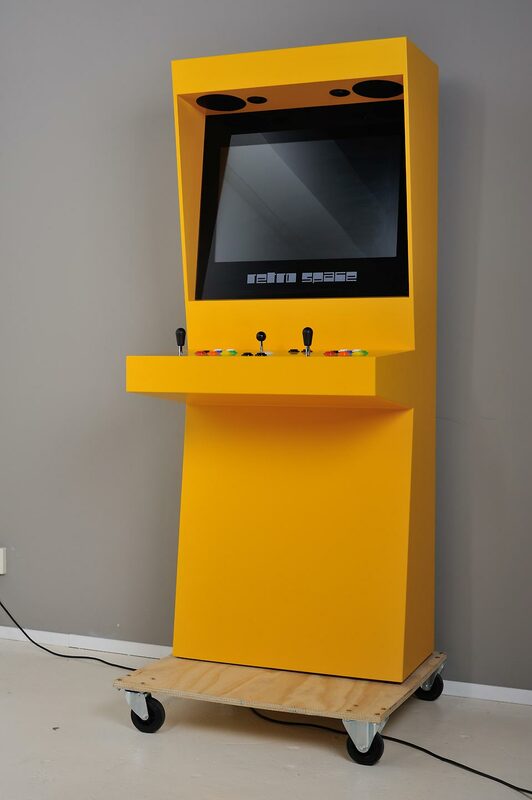 The stunning arcade cabinet fits either your 70's retro room or your minimalist interior. It is ready to play all the games you know from the past. Load it with all your music and movies for use as a media jukebox. And feel free to load it with software to add any functionality you might imagine in the future. First of all Retro Space is a retro gaming machine. 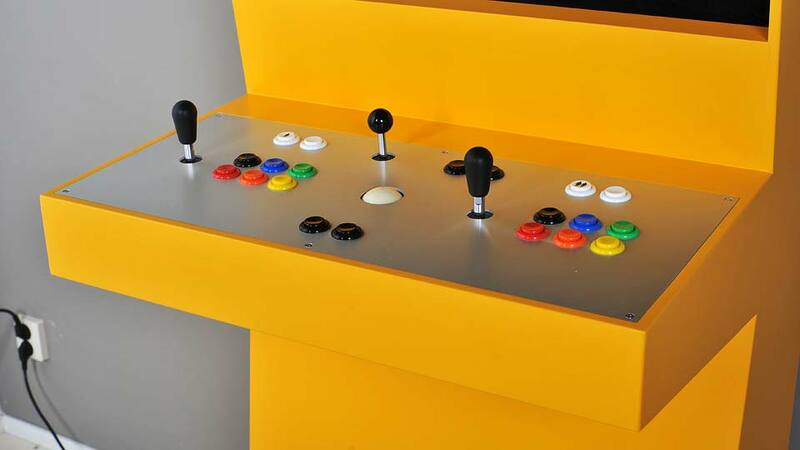 Equipped with real arcade controls in a durable and timeless aluminium cabinet it plays all classic 1 and 2 person titles with genuine arcade feel. Retro space comes with a pack of more than one hundred licensed arcade classics and all the emulators needed to play your old 8 and 16-bit disks and cartridges from the attic. Not only is Retro Space suited for retro gaming, it is also the perfect showcase for modern games and student work. Many schools use our Retro Space arcade cabinets for their anual graduation show and other promotional events that showcase the work of their students in game design and programming. The built in full HD screen can be used to watch high-def movies directly on your Retro Space. If you do not like standing while watching, let it drive the TV near your couch. We like to equip it with a 28 inch 1920x1080 MVA screen for perfect Pac-Man blacks, wide viewing angles and a wide range of refresh rate support to view PAL, NTSC and film content without judder. You are also welcome to supply your own screen. The VESA bracket allows many screens up to 10 cm depth and 28 inch diagonal to be mount inside. We can cut the bezel to your specifications. Tweak Retro Space to fulfil your imagination. Use it as video phone, as terminal to control your house appliances, let it monitor and talk to unwanted visitors, use it as web or media server. Or even use it to feed the cat while you are away. Nothing is too mad. The Retro Space production counter is at 121 right now. The 26 first cabs were bought by the Dutch Game Garden to promote the best game productions from the Netherlands in an anual event called Indigo Showcase. Cabinets are ready to go to the paint shop. Final assembly of screen, speakers, door and wiring. High precision CNC folded laser cut aluminium cabinet made of 7 modular parts bolted together. The side panels are brushed aluminium, the middle part can be powder coated in any RAL colour. The screen sits behind a 5mm tempered glass window with screen bezel. Ventilation and speaker holes allow for easy carrying. First class controls from Seimitsu, Sanwa and SuzoHapp. Extra durable heavy gauge wiring harness with tab connectors for easy maintanance. Blind mounting combined with easy replacement of parts. Totally configurable buttons, sticks and balls as keyboard presses, gamepad presses or mouse operation. Compatible with any USB device, from PC's, Macs to Rasberry Pies and Consoles. 1920x1080 pixel 28 inch MVA LCD monitor. 1:3000 static contrast, 300cd/m² max. Wide Gamut display: 100%sRGB, 85% AdobeRGB. Native support for 23,976Hz, 50Hz and 60Hz to show film, PAL and NTSC content judder free. Visual image area comparable to 24 inch horizontal CRT or 19 inch vertical CRT. Auto input select on HDMI, DVI, Display Port and VGA connectors. Optional second screen in the back to allow a bigger audience. Raspberry Pi 3 with custom Retro Space frontend, or a MacMini. 8Gb RAM, 256GB SSD, WiFi, Bluetooth, Gigabit Ethernet, HDMI, TB 2.0. BT keyboard for cordless typing, trackball for OS operation. Hi-Fi stereo 2x90 watt 2-way speaker system. Audiophile D-Class amplifier upgradable to Tripath T-class tube-amp like sounding amplifier. Amplifiers run really cool thanks to D/T-class high efficiency (>80%). No glued or laminated materials, easy to separate. Modular repair or replacement of parts. No phenol formaldehyde containing materials used. Perfect recycable thanks to all metal construction. Power consumption: 100 watt in full operation. The biggest client for the original Retro Space, Dutch Game Garden, wanted to be present at the Game Developer Conference (GDC 2013) in San Francisco. 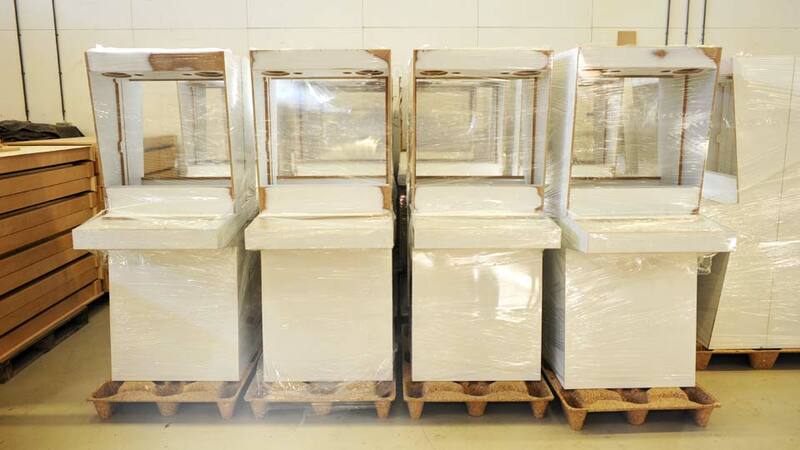 Shipping all original cabinets was not prefered as it would take a month by boat and truck with the risk of damaging the cabs. So Dutch Game Garden asked me to make a lighter flat pack version. Call it Retro Space 2.0, or the road edition. This time no hand sanded and spray painted version, but a DIY assemble plywood one. From march 25-29 2013, Dutch Game Garden used 20 of the new cabinets to show the best of the Dutch game industry in a special Indigo event at the Dutch Consulate in San Francisco. The first of a new series of Retro Space 2.0 cabinets. 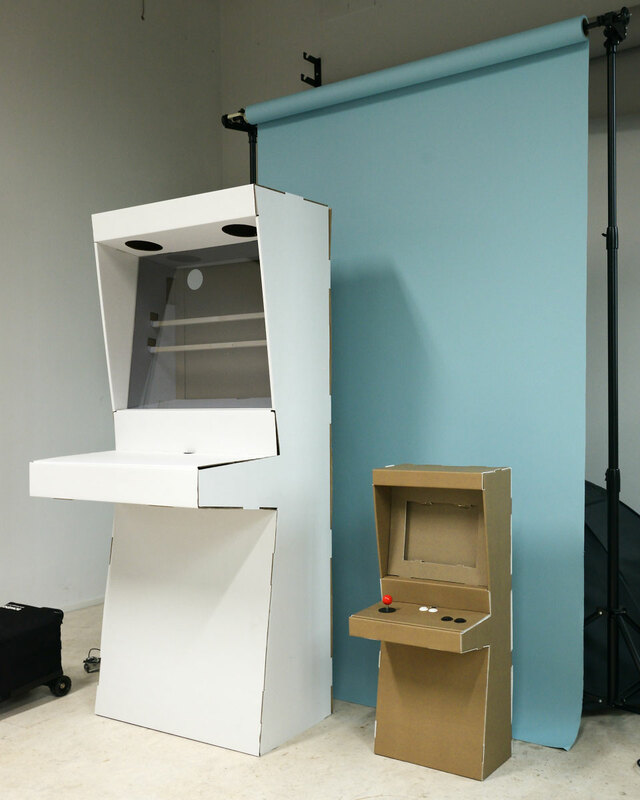 Retro Space 3.0: cardboard single event cabinets: 1:1 and 1:2 scale. Retro Space 3.0 and 3.mini are made in cardboard. You fold it yourself from 5 big sheets of pre-cut cardboard. Together with 2 wooden sticks and 4 plastic clamps it holds a VESA flat panel screen. The smoked plexi is laser-cut to fit the cardboard case. It comes with instructions on how to make a fully functional arcade control panel, sturdy enough for some serious play. Retro Space Cardboard is aimed at short events where you need a nice presentation of your games. You can easily carry it around. It has been spotted in San Francisco pubs during the GDC! The smaller version is perfectly suited for making a couch-arcade from your iPad. It can be ordered together with a Bluetooth gamepad controller, a real Seimitsu arcade stick and 5 arcade buttons. We do not track website visitors, there are no cookies and no statistics as viewing those is mainly boring. The only personal info that might get to our servers is your e-mail message, or your bills if you ordered cabs. If you want to get rid of messages you send in the past, please drop us... an e-mail. Or a phone call. Bills can only be removed after the Belastingdienst is no longer interested in vintage bills.